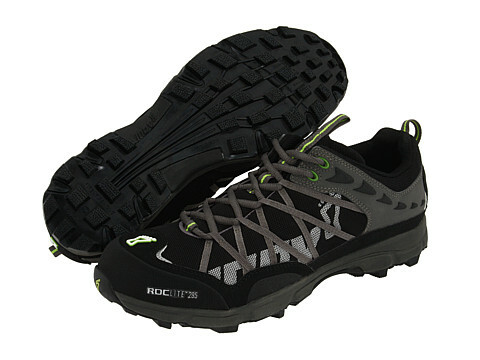 My passion for reviewing shoes continues this week as we look at the beefier and chunkier Roclite 295s from Inov8. The reason for trying this shoe was simple. I love the Talon 190s and the F-lite 195s, but for me they’re very much a racing shoe which I use for 50km and below. So still in the pursuit of a perfect 100 mile shoe, I decided to do some serious research in the Inov8 range to see what was on offer. What I need is a shoe that has around 5mm-7mm of heel to toe drop, a chunkier sole for protection and also something that was much more heavy-duty on the upper too. The reason for more heel to toe drop is that over distances of 60kms in the shoe like the f-lite 195s, (which has 3mm I believe) is the achilles tend to get quite sore after seven hours on the trail. I also wanted something with a little more grunt underfoot too. The soles of the 190s and the 195s are extremely thin, which again is fine for the shorter stuff, but for the longer stuff I do need a little more protection underfoot. So after quite a few hours of deliberation I plumped for the Roclite 295s. Having worn Inov8 shoes regularly for a year now, I was pretty confident about taking these out of the box and just hitting the trail in them. The scene of my first jaunt in them was 50kms in the Blue Mountains along the Anderson fire trail from Wentworth Falls through to Woodford and I wasn’t disappointed. The most noticeable difference between these and the more minimal Inov8’s is the cushioning underfoot and more protective layer. The trail is pretty rocky once you turn off King Tablelands Road and onto Andersons. In a slight difference to the other Inov8’s I have, this shoe is wider around the mid-foot, so much so that I’m considering wearing two pairs of socks with these shoes as they do feel slightly looser, even though I have bought true to size. I’m a big fan of these shoes and it’s fair to say that I jumped straight in at the deep end with them as my second outing in them was the Great Ocean Walk 100km race. This is a race that needs a heavier duty shoe which can cope with all the mud, water and sand on this course. They passed again with flying colours I feel and to the extent that they’re pretty much neck and neck with the Nike Frees as far as using them for GNW. So let’s start with the name, Roclite 295s are called as such as with every other Inov8 shoe, the numbers represent the weight of the shoe in a UK size 8. Having started out pretty minimal with Inov8 shoes, I didn’t want a really bulky shoe that weighs the earth. I want the best of both world’s, a shoe that is protective, yet is still light and able to adapt to differing terrains of GNW, such as dense bush, dirt road, mud and bitumen. This shoe really fits that bill. Moving to the sole, one of the big things for me is the flexibility of the shoe and being able to ‘scrunch’ it up that makes sense. I can’t stand shoes that have no give in them at all, and being a fore to mid foot striker, these shoes are again specifically designed to allow that to happen. Inov8 have what’s called ‘Meta-flex’ grooves, which basically means that the shoe will flex to your foot strike, allowing it to flow with your natural foot movement. Another noticeable feature of the Roclites is the appearance of what seems to be ‘Talons’ that you see on the 190 model. These are indeed similar, but there is much more cushioning underfoot so that after around 50kms you don’t feel the Talons starting to press against your foot at all. These grip the trail incredibly well. In fact that grip the trail so well that about 5kms into the GOW100km as I came to land in a big muddy patch the shoe stayed firmly in the mud and my legs just carried on running. Running in mud with just a sock is not a great experience 5kms into a 100km race I can tell you. These little ‘Talons’ as such also have the Inov8 ‘sticky rubber’ on each of them, so when you’re running on slippery rocks, again you feel very confident that the shoe will stay there and you won’t end up with some flesh wounds from trying to impersonate the idiots from ‘Dancing on Ice’. Up to the toe box and right around the front of the toe is a very hard and firm layer of rubber to protect the toes from rock strikes and alike. This is a novelty for me as I’m used to the flimsy Nike Frees giving me zero protection at all. Personally I don’t think I need it as I’ve become pretty adept to getting out of the way of rocks having worn the Nike Frees for the best part of 2.5 years, but still, for the wussies amongst us, it’s there 🙂 I think it also adds in a good layer of leech protection too for the GNW. The mesh on the shoe is very lightweight, which I’m assuming goes someway to explaining why such a heavy-duty shoe is pretty light on the face of things. There is also what Inov8 describe as Met-Cradle lacing (see picture to the left), which means that the lacing is webbed all around the upper mesh to provide what is meant to be a more secure fit. Personally I don’t buy into this as I’ve bought true to my normal size and the shoes do feel slightly loose to me. I haven’t worn two pairs of socks yet with these shoes, but I do intend to I think as I don’t think these are anywhere near as ‘tight-fitting’ as some of its more lightweight cousins. But this is a good thing for something like a 100 miler where your feet invariably swell and you need the extra room. So maybe those second pair of socks will come off post 100kms into a 160km+ race. Moving onto the heel, this was one area I had a few doubts on as I’m not a big fan of hardened solid heels and prefer as little structure as possible to it. Surprisingly however it was not an issue at all for me and it does feel very soft indeed. The heel to toe drop is also something that may surprise a few of your given the more minimalist shoes I’ve championed – 9mm to be exact. This is probably a little more than I would have liked, but it’s no biggie. So is this the perfect 100 mile shoe? Personally I think so as it has everything you need. Its beefy and chunky but not over-bearing and heavy. It grips like a mother and suits across pretty much most terrains you can think of. It will protect your feet and it will adapt as a race goes on, allowing your feet room to move about if they swell. I wouldn’t wear them for the shorter stuff – that’s what the F-lite is for, but for 100kms+ where terrain differs and you need adaptability, this is certainly a bloody good shoe to have in your arsenal. I have a slight doubt about the fit and do wonder if I should go down half a size, but it’s not a massive consideration for me as I think a thin liner sock will sort this out fine. As for price, well it differs depending on where you go – just do you research. As far as our star rating goes, I’ll give these 4out of 5. They’re a great solid shoe and if you want something that’s going to give you protection and all round control on the trail, you’ll be hard pressed to find anything that betters it. I’m certainly in a bit of an indecisive mode right now as to whether to wear these or the Frees for GNW. Hmmmmmm…. Interesting dilemma about whether to use Free’s or the 295’s. On the face of it you couldn’t get 2 more different shoes. I say – use whatever shoe is ‘kinder’ on the feet. My feet felt so bruised on the undersides the last 100 mile I did. No blisters but incredibly painful. Wise words you speak Danger… however there not as different as you may think. Yes one is sturdier in the upper, but in terms of cushioning and heel to toe drop, there’s not a lot in it. The Free is probably more comfortable a shoe because of the spongier sole. BUT… I think anyone who runs a 100 miler gets bruised feet don’t they? It’s just par de course for doing these runs n’est pas? Nice review Dan. Trying to decide between these, Mizuno Wave Ascend 5 and Salomon SpeedCross 3 for next years TNF100. Planning on starting in something light (probably Talon 212) then going a bit more supportive after CP4. Thanks for good info on this option. No worries Nick. Welcome aboard and thanks for posting. Its a very solid shoe, if you want more info, just let me know. Dan, when i did WS100 in 09 i was recovering from a broken foot. Had been running in New Balance 790s (not the culprit for the broken foot) prior but wanted some more protection for my foot going into WS. Picked up a couple pairs of the 295s and used them for WS (changed to a dry pair after Rucky Chucky. I encountered zero foot issues, no blisters, no hotspots, my feet didnt even feel sore afterwards. Great shoe in my opinion so long as the trails arent too hard, even then they’re not that bad. Nice review. I was thinking on the same inov about a year ago, but I just wait it out till a low drop shoe will come out with a thicker sole. In my opinion, there need to be time for adaptation if you want to run longer in low drop shoes. One of the most overlooked part is that 99% of the people who wants to run in minimal shoes like the F-Lites or X-Talons, live their daily lives in traditional 10-14mm heel-toe offset shoes. If you spend 9hours a day – probably more – in elevated shoes, than 2-3-4 hours of running in flats won’t totally effect your footstride and your lower leg muscles and tendons, ligaments. I am using Vivobarefoot or very rarely VFF during “life”, like office and shopping; Vivo also have now zero drop hiking boot, first in the industry. Unfortunately most of the low drop shoes are coming out with thin soles, what can be a huge problem over a 100K or Mi race. Of course you can get used to it, and bare the pain, but it can be a performance limiting factor. I recently did a trail race in the X-Talon 212s, and a sharp razor like piece of rock totally went through the sole, not through the insole though. There is a nice looking Merrel coming out: http://www.youtube.com/watch?v=T02aJs3G_Qw 4mm drop. Also the Altra Lone Peak is hiting the stores with thicker sole and Zero Drop. Nike is very very quiet still, I am 100% sure that they are creating a massive line of minimal shoes with some excellent transition philosophy. Nice review Dan. Like Danger I can’t understand a more different choice than Nike free vs Roclite 295. Back in 2007 I was not sure whether to use my Brooks Cascadias or Inov-8 Flyroc 310’s for WS100 but went with the latter for the superior “feel” for the trail, flexibility, breathability and also likely better drainage after Rucky Chucky crosssing. It all went well- no blisters, hot spots etc and the toe protection plate wsa actually helpful a few times- the thicker sole gave enough underfoot protection- unlike Talons or NB MT 100 series. – The underfoot soles are fairly similar in terms of cushioning. Need to research it but the heel to toe drops re not too far off either. I think the Free is quite often passed off for a minimalist shoe, but I don’t think it is in the slightest. I worn them for the Northburn 100 miler and this is part of my dilemma. – The Free actually has a very spongy sole, which I think make it pretty darn good for the likes of GNW. Where it comes unstuck is on downhill running and loose dirt track. The traction is piss poor. The roclite is solid as a rock. However I do agree with you guys that when you look at the shoes they are very different in terms of build. Especially now since Nike has removed the heel effectively from version 3 of the Free. Except you’ve only done 2 runs in the Roclites and 200 runs in the frees. This is very true Andrew and I hear what you’re saying. What I think you’re saying as well is that it’s important to do what you’ve always done in training and work with the tools you know best and that are tried and tested. Sometimes, the sensible option in terms of shoe i.e. the roclite isn’t always the one you go for, and that the stock shoe will win through. I’ve become a huge fan of the 295s. After spending a year trying to find the right shoe for my wide foot I discovered Inov8 and the 295. Fits me really well. Shoes are often ok in the forefoot but too tight through the midfoot. The 295 fits perfectly through the midfoot – totally understand how a normal foot would find it a bit roomy. I’ve run races of 77M, 50K and 50M in them and have another 50M next weekend. On my second pair now and they are a great everyday shoe given the roots, rocks and mud of the eastern US (VA specifically). If anyone has a recommendation of a lighter Inov8 shoe that’s got room in the midfoot let me know! Hi Andy, welcome aboard and great to have you commenting on Ultra168 – I take it you’re in the US? Good to hear of your experiences in the 295s, certainly helps some of our Australian readers as we tend to get shoes a little later down here. I know a lot of people really rate the Talon 212s, particularly some of the smokey gun runners such as Brendan Davies and the likes of Martin Fryer too… thanks for your comments and looking forward to hearing from you again. I am in the US. I do plan to check out a pair of Inov8 road shoes later this month – Road-X 255. Are the road shoes available in Australia yet? Hi Andy, I too have a wide midfoot. Even 4E width road shoes only just fit. I have the new Merrell Trail Glove wide version and it fits beautifully, but want something with some extra protection for longer stuff. The 295s sound great, but can anyone advise whether they are as wide as say the Altra Instincts (slightly too narrow for me! ), the Trail Glove Wide (perfect) or Asics 2150 4E (just wide enough). I live in Vanuatu at the moment, so have to get shoes brought over to try and don’t want to bother with the 295s if they are not as wide as the ones I’ve listed. Thanks for any help. I don’t know if they’ll fit you but I’m on my 3rd pair now and they’ve fit my wide feet well. I’m often a 4E, at least 2E in road shoes. If it’s helpful, I’d recommend using the shoefitter on http://www.runningwarehouse.com. You can look up the 295 and compare it to another shoe and get a 3D and 2D model comparison. Hope that helps! Good to have you on board Andy. Not too sure about he road shoes being available here in Australia – things tend to come to us quite late – would have to check. Barefoot Inc (the Aus distributors) are only stocking the Lite 155. I’m wearing the Road-X 255 is my primary road shoe now – clocked in about 500km in it and am very happy. Dropping down to the 233 next time around. The Lite 155 is basically a 5 Fingers with laces and too extreme for me. Shame that no shops in Sydney sell Innov8 (that I know of anyway). I have problematic feet so not prepared to buy runners without trying them on first. Footpoint Shoe Clinic in Mosman have a large range of Inov8 models ready to try on at the moment. They have a podiatrist in store on Saturdays or by appointment, the trac-lab video service and also a 30 day fit guarantee. All the staff are runners and will be able to help you out. Great, thanks for the reply Andrew. Dan, how was the heat factor with these shoes? I currently wear Asics Trabucos which I quite like apart from one thing, I find my feet get very hot in them. They’re fine in winter but I need something cooler for this time of the year. I found them fine at GNW, which gets pretty hot on race day! The upper mesh on most Inov8 running shoes is quite thin, so they’re very breathable – hence why they are lighter than most running shoes around I think. Inov8s tend to be very rough and rugged on the rubber and sole, but light and breathable up top. I’m going to get my hands on some X-Talon 212s I think too and will do a test run on these ahead of 6ft with a view of wearing them for the race. Let us know if you need anymore information. Cheers. 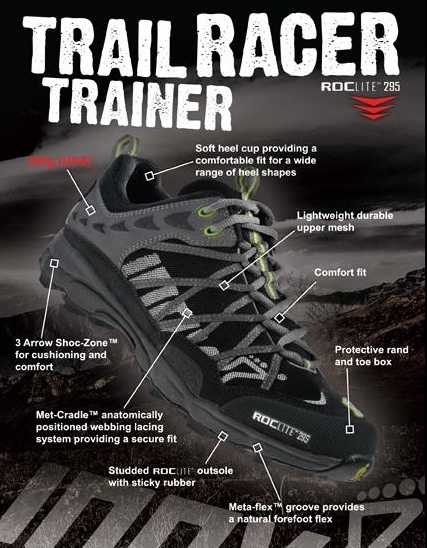 Dan, since this last post have you had a chance to compare the roclite 295 to the trailroc 245? I am looking to replace my pair of Saucony peregrine. I like them very much but the toe box is too tight and they have started to tear after 300k. Most of my runs are 20-30k on hard surface trails and hills in Hong Kong.